PRIMARY teacher Patricia Crilly can only guess how many refugees have stared into the Southern Cross on their journey to Australia. The Year 4 teacher and school choir co-ordinator at St Luke’s Catholic Parish School, Capalaba, is a refugee advocate who has tried to understand the terrifying journey refugees have made while fleeing their homes. Mrs Crillly (pictured) said she received some insight into the plight of refugees while visiting the Brisbane Immigration Transit Accomodation centre in Pinkenba. “Going to the detention centre was a big wake-up call for me,” she said. “I was involved and meeting people and hearing their stories. But the thought of thousands glaring up at the Southern Cross has always stayed with the England-born Catholic. “I started writing about the Southern Cross and all these images came to me and it wouldn’t leave me alone,” Mrs Crilly said. Her writing eventually turned into lyrics for her first song, Refugee, which she recorded recently. The song follows the journey of a refugee fleeing their homeland with a baby and who is “looking up at the stars and not knowing really where they were but the spirit of the Southern Cross is there”. 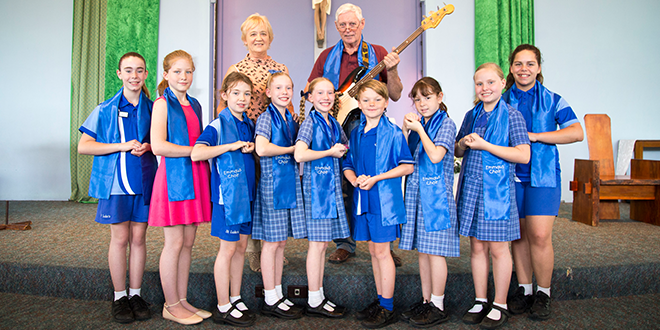 Featuring on the song is St Luke’s own school choir, Emmaus Choir, and local Redland Bay musicians John Dillon and Steve Sparrow. Refugee has already been played on Byron Shire community radio station Bay FM and has received support from Afghan refugee and photographer Muzafar Ali, who was at the centre of a 2017 documentary The Staging Post. Mrs Crilly said she met Mr Ali at a screening of The Staging Post and shared with him the idea of showing his photographs while a choir performed the song. “I gave (Mr Ali) a copy of my song and I said I would love to have images,” she said. The song will also be used by an Australian nurse who has worked in refugee camps in Europe and will be taking a team of teachers and volunteers to Bangladesh this month. Mrs Crilly said she would like to see her song being used by schools and universities across Australia to educate people about refugees, and wanted no profit in the process. “It’s more about educating and advocating and giving a voice to people who probably have a voice but not many people are listening to their voice,” she said. “I think art is a wonderful medium for giving people a different paradigm shift and making people think differently. Mrs Crilly believes the Southern Cross is a perfect metaphor for the open arms of Christ. “The Southern Cross is a beautiful image because the Cross of Christ is there as well,” she said. Next: Is there a Latin Mass revival in Brisbane’s country towns?